Loading Screens. SWTOR is making me hate loading screens. The original Guild Wars was not the greatest game when it came to loading screens. Fortunately once you had all the instances downloaded, those screens became short and barely worth mentioning even if you encountered them constantly. In Runes of Magic you usually only encountered loading screens if warping to a specific location. If just running from one zone to another no loading screen could be noticed and it was actually quite pleasant. Rift handled things this way as well and I believe both games modeled this after WoW. But SWTOR? Oh SWTOR. Each planet has several zones and you can load between those zones in a free and uninhibited way much like the WoW model. But curse your damned hide if you want to travel to more than one planet in a single play session. To go from Hoth to Tattooine I would have to go from the Hoth spaceport to the hangar instance, from the hangar to the ship instance, from the ship instance to a hangar instance, from the hangar to the Tattooine instance. And believe me, some of these hangars, some of these spaceports are huge. Depending on where you start from this process can take quite a while. The worst part is I love the grand sense of scale in SWTOR. I mean these places feel big, gigantic even. City planets feel like city planets and vast wastelands of ice or sand feel like vast wastelands of ice or sand. The distant lengths you travel just inside the Coruscant spaceport itself makes it feel like a spaceport designed not just for the players of the game but for the denizens of that planet. Unfortunately I don’t think the designers considered for a second that nobody likes airports or spending time in them. I appreciate that Bioware has gone through the trouble of making my ship feel like my ship. They took the time to make it all seem quite epic. But at a certain point I don’t want to spend the 5 to ten minutes just getting off the planet, it’s not practical or fun. I don’t mind loading conversations with NPCs, it is usually quite short and unobtrusive. I don’t mind loading my ship or a new planet. I do mind loading in hangars just so I can walk through them to get to the part where I load my ship or a new planet. It is facepalm design. Fortunately Guild Wars 2, although it has loading screens and plenty of them, doesn’t seem like it has unnecessarily annoying ones. The zones seem quite large only requiring loading when doing personal story, moving to another zone, or traveling to a waypoint as when you’ve died. Now that is a new kind of death penalty. Now that I’ve finally finished Skyrim ending up with all but one achievement, I’ve finally started up SWTOR. What’s funny is my already good impression from the beta has improved considerably. Part of that is the fact that my graphics card died and was replaced with a card that has more video ram and I installed 2 more gigs of ram as well. Everything looks effing gorgeous now. Which is funny because I just plain don’t go in for cartoony looking games like World of Warcraft. Perhaps the Clone Wars cartoon has had more of an effect on what I expect out of Star Wars aesthetics than I thought. Anyway with the hardware upgrades I’m definitely having a much smoother ride, shorter load times, nicer graphics, fewer bugs, and those were some of my major gripes during the beta. One thing I’m a little disappointed in is my smuggler storyline. I guess I feel like it’s a little predictable. Where playing my imperial agent felt like I was a smooth and suave badass, playing smuggler feels more like I’m way too helpful. I’m a smuggler and yet I am constantly dragged away from the one thing that should make any difference to me. My ship. I shouldn’t be such an angel, but they cover it up by pretending I do it for the money, which on the other hand just makes me feel like a sociopath. At least when I was an agent I had an excuse, I was sith. Overall I’m not impressed with the story so far but there has been a few moments and surprises. I guess I just wish it was a little more crime noir and a little less naive adventure story. Ord Mantell wasn’t particularly impressive either. While I did think it moved away from typical Star Wars settings, a hybrid between wilderness and city rather than the far extremes of both, there were few moments where I slowed down because of something impressive to look at. I am mostly enjoying my skills as a dual wielding gunslinger however. I think it’s better than the rifle of the agent and I didn’t enjoy the lightsabers beyond marveling at how awesome they look. I’m also impressed with Coruscant. Something about the way the fast travel speeders give a grand idea of scale makes me love the place. Sometimes the hubs, like on Ord Mantell feel too spread out. That’s about the only negative thing I can say about them. I really need to get a mount. Anyway I rolled on Sanctum of the Exalted since aside from that server I only know one person playing on a PVP server. So if you’re on that server, I’m playing as Huntt, look me up. As I was playing through the SWTOR beta I took note of their fast travel system. 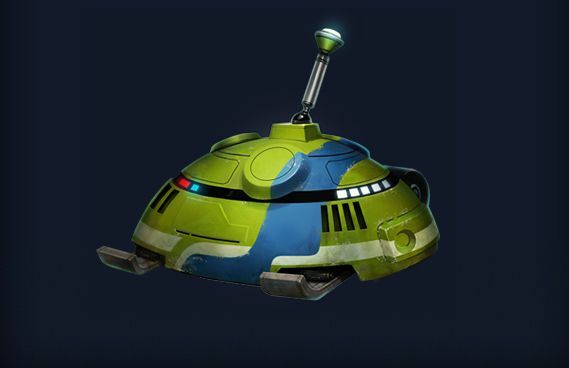 Basically you jump on an automated speeder to travel long distances between outposts. As you travel you can see what’s going on, zoom by people and mobs. Speeding through the trees at a breakneck pace. I like how it sort of gives the impression of being connected to your surroundings, even though it’s fully automated and you aren’t. On Dromund Kaas it’s also used to give the impression of great scale as well, being flown amongst skyscrapers to get to your destination. It was a bit buggy when I was trying it out, mostly due to my own lag and lower specs. It would take a moment after arriving to begin walking again. However as far as traveling goes, I think I enjoy it as much as instant travel in Guild Wars or teleportation stones in other games. Now obviously SWTOR is not the first game to have this sort of system, WoW and LOTRO come quickly to mind, but I thought it was better done than those games. In Lord of the Rings Online I was nearly put to sleep by the sheer scale of traveling. Jumping on a horse to take you to the next town took what felt like 10 minutes. I literally nodded off once or twice. World of Warcraft I don’t have much experience with, so I won’t comment. But SWTOR had particularly swift transportation, all while not breaking immersion. And that was interesting. The immersion wasn’t broken for me. It wasn’t perfect of course. Arriving at the capital meant that you couldn’t take the speeders inside the city, and I felt it was a painful walk to get to the speeders that took you to your class quests, or the speeders on the west side of the city. Why they all couldn’t be fully integrated with one another is beyond me. “Don’t provide fast travel if you’re just going to break it up into bits and pieces”, I kept thinking. I still enjoyed the system but every time I play a game without instant travel I find myself missing it. This has been the case since I started playing Guild Wars. Once you’ve truly well and seen everything, jumping from point to point feels like a huge time saver and stress reliever. Which brings me to Guild Wars 2. They have a great footing in lore to explain their fast travel this time around, the asura are masters of the arcane and perfected asura gates long ago. The ease of use and convenience factor will be welcome after a time, but would a more tactile or visually appealing fast travel method be appealing to anyone else? Traveling through Tyria on a mount, soaring over it on a bird, or zooming through the trees on a mechanical contraption would be excellent in my opinion. The companions which have an available bio. Some people don’t like Bioware games. I don’t get it. My guess is the mechanics of the game keeping them from enjoying the usually magnificent story. Me, I’ve been playing video games for a long damn time. I’ve been exposed to the bare bones of gaming so when I come across a game with a few flaws, I don’t necessarily let it instantly ruin it for me. Apparently companions are one mechanic a lot of people could do without. Many don’t appreciate the henchmen or heroes in Guild Wars for example. They think it allows people to play without others. And while it does destroy the PUG community, I can’t say I miss having to group with idiots, trolls, incompetents and malcontents. I’ve always thought of it as a tool to allow you to play with friends without having to diplomatically decide who will play what class or what role. No one wants to play monk? No problem. Which brings us to Star Wars: The Old Republic’s companions. Companions don’t play the same role they do in Guild Wars. They are a huge story element. You quest for them, you get to know them, you romance them, they do your chores, take out the trash and are customizable. On a mechanics level I think they’re actually more akin to pets. I think they effectively make every class in SWTOR a pet class, which is actually kind of interesting. I had experience with two companions. Khem Val and Kaliyo. Khem Val is essentially a tank as demonstrated in the video. My inquisitors pet. I found that because I was playing a Sith, even though I had some ranged attacks I often closed with people early on. That meant that instead of being shielding by my tank I was often right beside him. Kind of annoying. I definitely should have changed tactics but it was my first play-through and I had no idea what I was doing. His personality left something to be desired. Even when I was being evil it was not good enough for this guy. You have to be seriously rotten to impress him. Also I’m not really the type to enjoy a companion who walks around in a loincloth although I’m sure that can be changed later. Because I didn’t like him, I never looked into it. Kaliyo was a doll. My agent’s pet. I liked her voice, her personality, her look. It was a little more difficult pinning down just where she draws the line with regard to authority and the light/dark side of things but I handled it. She often took the brunt of attacks though I believe we were both focused on range. Interesting that I’m describing them in terms that might be different than any other game where you’d have something like this, no? This is the first promotional video from SWTOR in a while that really caught my attention. In SWTOR companions are more than an impediment to grouping. They’re a pet, a friend, a helpful tool. Yes they sometimes take up a group slot. For better or worse. No, not at all. I don’t get why people feel they impede the sense of being in an MMO. Then again I don’t get why some people feel the blasters should kill with one shot, and that’s effing ridiculous, so maybe I should just resign myself to not getting why people won’t get over their own baggage and just enjoy the game. I read the latest Arenanet blog post and while it is interesting, it isn’t anything they haven’t spoken about before. It did trigger a few thoughts however. I’ve been thinking about the Guild Wars 2 cinematics in comparison to Star Wars: The Old Republic. Arenanet has gone with a sort of tableau, a moving painting, that shows off people talking to each other from a 3rd person perspective. Star Wars: The Old Republic has a much more modern cinematic approach, the camera moves around, there are close ups and distant shots. But that is Bioware’s goal isn’t it? Recreate a sort of movie experience within a game. Telling a story is the most important aspect of their game, and I think plainly so. I think the emphasis is different for Arenanet. They love stories of course, but they’ve also got a ton of other things going on. The art and beauty of Guild Wars 2 in my opinion is unparalleled, their gameplay is ahead of other game companies, and I think their focus is on the player. The result shows up in the cinematics I think. 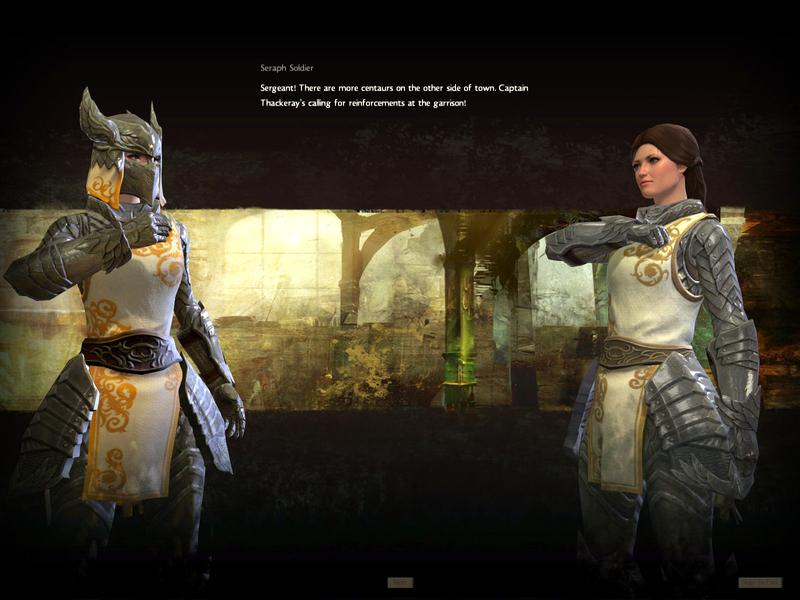 In GW2 you get the player front and center, showing off their armour, their look. A painterly backdrop and a connection to your character. Bioware is far more like watching a movie. Plenty of face time for the NPCs, a sense of space with the camera moving around, and a connection to the story. I applied to join the Star Wars: The Old Republic beta something like 2 and a half years ago, maybe longer, and a month or two back finally got my reply. I jumped at the chance to sink my teeth into the beta! Opening up that 30gig download and holy crap! 30 gigs! Sigh. I have DSL. This thing took an age and a half to download. On my first attempt, Bioware suddenly informed everyone that they had to download the client again if they hadn’t finished the download. If that wasn’t enough, running this game on a measly 2 gigs of RAM and 512mb of VRAM when the beta forces you to run on high settings is…not good. But setting aside the massive load times, the weird clipping and video problems that came with not being able to move to a lower setting, I actually really like the SWTOR beta. I don’t so much like the quests. I mean I do, well, I’ll explain. Every single quest in Bioware is voiced. It is awesomeness. It really changes up the dynamic of just reading boring text that has nothing to do with anything. The writers get rid of all the extraneous material so they can focus on what can be said aloud. I think if you are writing text as opposed to dialogue you get dragged down by the length. The voice overs have more of an advantage in the actors as well, because the tone and attitude can often tell you more with less words. Add to that that you get to hunt around the dialogue trees for the options that will please your companions or gain you dark/light side points and this part of questing is actually pretty fun. I do love Bioware games and this is yet another Bioware game. But I don’t like much of the quest content. For the most part they are very typical quests, not unlike Rift or World of Warcraft. I don’t have much else to say about their bad qualities, I mean, there are people out there that like this type of quest, I’m just not one of them. What I will say is that although I only got to around level 15 before I stopped playing the beta, they didn’t seem excessive. Many of the quests had bonus options of killing 10 of this or 12 of that. You could ignore these options and just finish off your basic quest with no worries. Another thing that made the quests bearable was that I felt more connected to the activity thanks to the voice overs. You really shouldn’t underestimate how much this improves the questing experience. And that is my big takeaway from the beta. I can play this game despite its reliance on old fashioned basic quests. It feels like a Bioware game despite the change in mechanics and other players running around. I like the game overall but I’ll talk about some of the things I don’t like along with other interesting notes in another post. 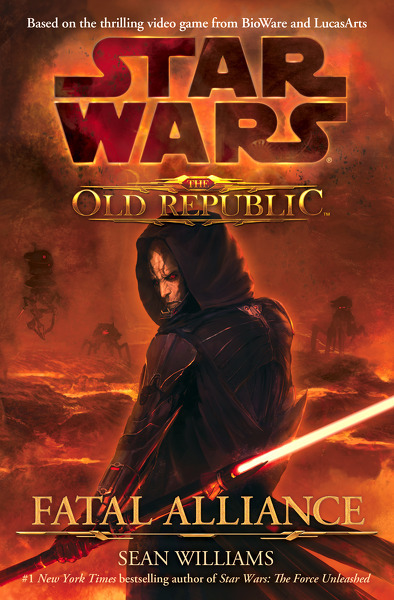 You’d have to live under a rock to not know that Star Wars: The Old Republic has a release date, December 20th. For me it’s awkward timing and although I’d like to pick up the game 5 days before Christmas it might make more sense to wait. Either way I’ll definitely be playing SWTOR even though I haven’t really blogged about it over the past few months. I suppose I could have blogged about Huttball and how bizarre the notion is. Two factions at war coming together to play a blood sport? Any lore problems aside I’m fine with it as long as people find it fun. I read at least one blog where the author seemed to think the PvP in SWTOR looks more impressive than the PvP in Guild Wars 2. I can’t say I agree, but Huttball is definitely going to make things contentious. I do like the recent reveal of companion customization however. Not all Mako need look alike. That was kind of a relief for me. Everyone is going to have the same companions for their story, but let’s face it, just the slightest amount of customization allows people to feel like their companions are their own. For me, every other Bioware game on some level has been about the companions. The one thing I definitely wanted to talk about but have probably spent too much time yammering about in other posts for other classes, is the smuggler character progression video. There has been one for nearly every class. Smuggler got the short end of the stick coming out at the end or at least near it. Watch for the Indiana Jones style take down. Could stand to lose the cape though. Anybody check out today’s galaxy map? I found it to be pretty cool, just late and not very useful. I don’t see myself looking at it after today since there isn’t any information there I haven’t already seen and can’t find elsewhere. Come to think of it, is that supposed to be Darth Chratis? Isn't he supposed to be old and decrepit? It took me a while to read Fatal Alliance, it came out in July of last year, but I’m glad I got around to it. I am not quick to buy a hard cover, they are cumbersome, overpriced, and a storage issue. When it came out in paperback I picked it up relatively quickly. I’m also usually hesitant to pick up game tie-in novels for relatively obvious reasons. Poor quality, dumbed down, and strict adherence to lore with little added imagination. Fortunately the author, Sean Williams has worked in the Star Wars Extended Universe previously, and reading through Fatal Alliance quickly resembles the majority of Star Wars novels. There are naval battles, jedi duels, firefights, mysticism, sci-fi ideas, and to top it all off as usual there is some form of grand non-sensical idea that mixes everything together and despite all effort doesn’t quite manage to ruin the entire book. It goes from a mysterious auction to a heist story, then quickly into an action movie, then into space battles, a bit of a militaristic assault, into a fantastical finale that almost seems like more of a spectacle. Most of the characterization is well done but I think you can tell which characters Williams likes. Despite her awful name Eldon Ax is deadly, smart, and powerful. She ingeniously makes her way inside a vault, outsmarts and overpowers a jedi, and stands toe to toe with the main villains. I was pretty surprised that the book tries to incorporate every type of player class in the novel. It seems at first like an idea corporate headquarters sent down to Sean Williams. For the majority of the book I think he does an excellent job overall of tying everything together, making the characters work, showing (for the most part) their motivations, and why such a complex group might be thrown together. However you are still left with a sense of confusion afterwards. Many of the actions and motivations of the characters are easy to comprehend, but there are 8 characters. I’m just left wondering why some of the characters do what they do. It just doesn’t feel natural at times. The bounty hunter presence, the imperial agent, or the smuggler, all move mysteriously and in the shadows. It fits the theme in some ways of those classes, but here it is just an excuse to cover up the fact that they don’t seem to have any real reason to be involved throughout. There is a lot to like in the book. Characters, lore, action, and mystery. Essentially there are plot holes you could drive a truck through but altogether I did like reading it and wouldn’t have a problem suggesting it to Star Wars novel fans. It’s Star Wars. It’s Bioware. It’s online. Star Wars: The Old Republic officially opened up pre-orders recently and I was surprised to see what they had to offer. Their collector’s edition costs $150. I was a bit taken aback. It used to be that you could pay $200 for a life time subscription to some games. Lord of the Rings Online being the most prominent example I can think of. To think that a collectors edition now costs nearly as much sort of blows my mind. Sure the CE contains a statuette that makes up much of the cost, but I can’t personally fathom paying so much money for something that seems to me to be a money grab. Here’s a list of what is available. The pre-order exclusive section goes to anyone who pre-orders any version of the game. Most of the digital items come with the digital deluxe edition ($80) except the “exclusive” ones. The rest obviously come with the CE only. I really don’t find the Digital Deluxe or Collectors Edition appealing and hopefully I can explain why, point by point. A statue of Malgus. Okay it looks like a decent statue. Not much to make fun of here except that it adds about $60 to your CE cost. The game disks metal case. It’s an online game, an mmorpg, and most of the game is going to be downloaded. I find it difficult to understand why you’d need a particularly special box to hold your game disks in for this type of game. Any mmorpg game disks become quickly outdated since mmorpgs are patched significantly after launch. So perhaps it’s a nice thing to put on display, but really, it’s useless. The journal. Hard to say. It sounds as though it could be a written rehash of the timeline videos on the swtor website. It could be an interesting and fun thing to include, but there is little information about it. The galaxy map. Aside from the fact there are plenty of places to find a map of the Star Wars universe from various time frames, I suppose I can’t crap on this too much. I would like one of these up on my wall. The authenticator. Call me crazy, but game companies that charge a $15 subscription fee along with the price of the game, and even $150 for their CE should probably provide free protection for game accounts. Seriously. What the hell. The music. I’m not a fan of getting another copy of some music I just bought in game form. First of all if I own the game, this should be a freebie somehow, not part of some over-priced CE. Couple that with how personally, I can only listen to game music in the context of playing games, and you’ve lost me. The high quality box. Yeah. Enough said. It’s a box. Didn’t I already get a metal one of these at the top? What? The in game vendor. I can’t find much information about it. Not sure what you can buy, or whether it’s worth it. How do you expect to sell people on things without more thoroughly explaining what some of the items are? The mini-pet. Nice enough I’m sure, but I’m betting there are some available in game as well. Setting aside the price of the game ($60) and the statue (some say around $60) I’m still paying $30 for very little overall. A poster, a booklet, a mini-pet, access to an npc store, and two things I should be provided with for just being their customer in the first place, music and security. Of course you do get the other digital deluxe items ($80) but in my opinion they’re still overpriced. They are essentially a mount, a couple of emotes, a combat pet, and a holocam of which there is little information. Is it a mini-pet, something else? These cost $20 extra. I just don’t know where MMO companies get off charging so much for so little. Perhaps it’s our fault for paying for this crap, or their fault for being greedy, but I won’t be buying the DD or CE for Star Wars: The Old Republic. I refuse to be gouged. It’s a shame though. I’m EA’s target demographic for Star Wars products. The fact that they can’t entice me with their statue, soundtrack, or booklet should tell you something.